Amethyst is a purple mega-quartz, or macrocrystalline quartz. Sinuous tendrils of vines, a traditional Balinese design, surround one and a half luminous carats of amethyst. 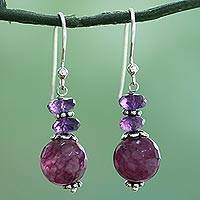 Wirabhuwana of Bali presents this pair of stunning dangle earrings crafted from sterling silver with a high polish finish. Celebrating the powerful beauty of natural amethyst, Peruvian artisan Carlos Yauri designs a striking cocktail ring. This ring circles the finger with sterling silver rope motifs that form spiraling patterns. 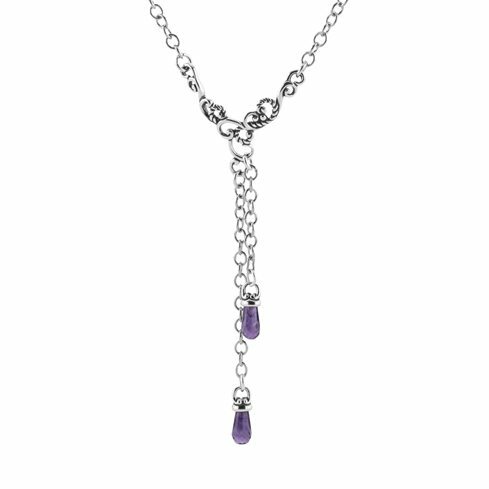 A single stone of amethyst centers this majestic accessory. Beginning his career as a sculptor, Nyoman Rena puts his skills to use in crafting beautiful pieces of jewelry. He designs this Indonesian cuff bracelet from sterling silver to depict the fierce faces of tigers. 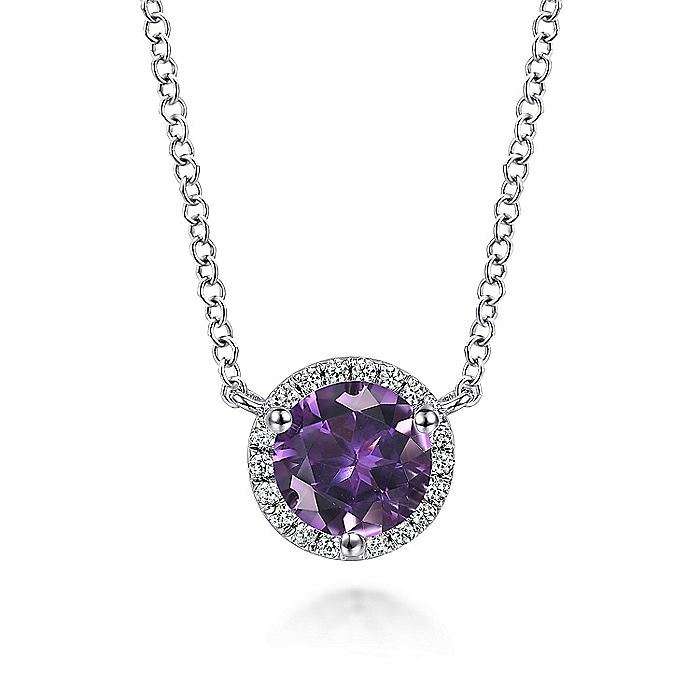 At the top of it is a single stone of amethyst weighing three carats for a beautifully regal look. Swirling motifs create an exotic finish on this cuff bracelet from Komang Wijayana. 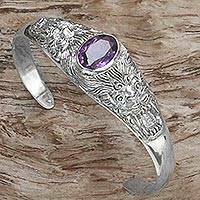 Handcrafted from sterling silver, the bracelet exudes Balinese style. 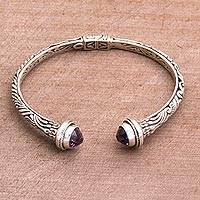 More than two carats of amethyst gemstones mark the ends of the cuff. A concealed hinge makes it easy to put on and take off. 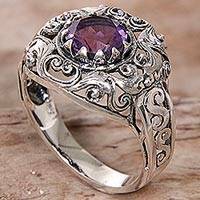 Designed and crafted by Indonesian artisan Agung Jagra, this ring features a 1.5 carat amethyst. Sterling silver leaf and swirl designs outline the faceted stone and twist down the side of the ring's band. Inspired by the beauty of Mother Earth, Guatemalan artisan Lorena Cofi�o designs this stretch bracelet. 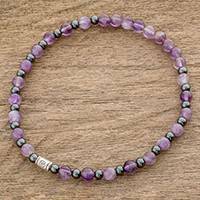 Alternating beads of amethyst and hematite encircle the wrist, centered by a petite sterling silver bead. 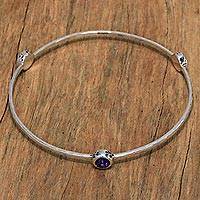 By Janice Girardi of the Bali Animal Welfare Association (BAWA), this bangle bracelet is handcrafted of sterling silver. 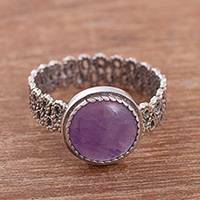 It circles the wrist with a simple band with a hammered finish, featuring three sparkling amethyst bezels. Each bezel is accented by oxidized paw print motifs. Every purchase of a Janice Girardi Designs for BAWA sterling silver jewelry item will provide a life saving vaccine. All profits go the animals. 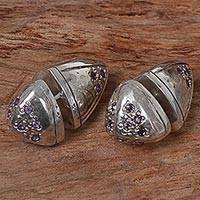 These stud earrings are the design of Indonesian artisans Arya and Ardi. 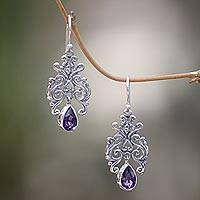 Petite amethysts dot the earrings, which are elaborated from sterling silver in cone shapes that start in the front and finish behind the ear.